Make the most of a week by uncovering the highlights of the intriguing and varied country of Serbia. Learn about the nation's recent and ancient history in Belgrade, once known as the capital of Yugoslavia, and also in Novi Sad. Our discovery of Serbia will begin in the capital, Belgrade. This romantic city lies on the confluence of the Sava and the Danube Rivers and it's said that Belgrade, meaning 'The White City', is where the rivers met and fell in love. However, it's certainly not always been a peaceful picture, but bustling with locals and tourists it's now rising from its turbulent past and is quickly becoming one of the must see places in the Balkans. Today will begin with a guided walking tour of the capital to discover the fascinating history including that of the Roman and Ottoman empires through to the more recent conflicts of the early nineties. The city's highlights include Belgrade Fortress and the surrounding Kalmegdan Park, overlooking the rivers. Built by the Celtics, the fortress has been strategically used by the Ottomans and Romans, burnt down by the Goths and Huns and since rebuilt. This afternoon we have free time to wander at our own pace and, now much of the city has been pedestrianised, it's a leisurely experience. Alternatively, you can join a boat trip along the Danube and Sava Rivers, which lasts for about 1.5 hours, in order to see the city from a different perspective. Tonight you can choose to dine at one of the many restaurants or cafes, often with outdoor seating, so you can sit enjoy watching the world go by. This morning we will drive to Novi Sad. Novi Sad, meaning 'new garden', is the second largest city of Serbia but it boasts a more laidback atmosphere; with most locals choosing to enjoy a coffee on the banks of the Danube rather than rush anywhere. On arrival we'll have a guided walking tour ending at the Petrovaradin Fortress from where the city originated. You have free time this afternoon to visit the fort is known locally as 'the Gibraltar on the Danube' due to its shape rather than its size (despite what the locals say!) and discover more of the city. The 16 kilometres of hallways deep under the fortress lead to dungeons, which have been home to Karadorde, leader of the first Serbian uprising against the Ottomans, and Tito, the former Yugoslavia's long reigning president. Like Belgrade, Novi Sad's position on the river has made it a frontier hard to break in many wars and is rich in Roman, Greek and Byzantine history. In the late afternoon we'll continue our drive to Sabac where we spend the night. After breakfast we'll set off on a 3 hour journey to Bajina Basta in West Serbia. The Drina River roams through this small town and is the border between Serbia and Bosnia and Herzegovina. We'll enjoy a traditional lamb lunch in Bajina Basta's oldest pub before heading to the town's Rakia distillery. Although the distillery doesn't look like much from the outside, inside we will see how they create Serbia's favourite fruit brandy and have a chance to try some of their produce. This Rakia factory, like many others, was state owned during the years of Yugoslavia and just before it nearly shut down the local people and one main investor pulled together to privatise it so they could continue production. Next, we make our way into Tara National Park. According to mythology, Tara Mountain gets its name from the ancient, Slavic God Tar who chose this area as his home due to the outstanding natural beauty. We will take a one hour walk along the gravel path to Banjska Stena which is arguably the best view in Serbia. From this vantage point you'll be able to look out over the Drina Canyon and mountains in the distance. It will be quite the contrast to bustling Belgrade and Novi Sad and it really captures the beauty of Serbia. We'll then take the drive to Mokra Gora which is our home for the night. 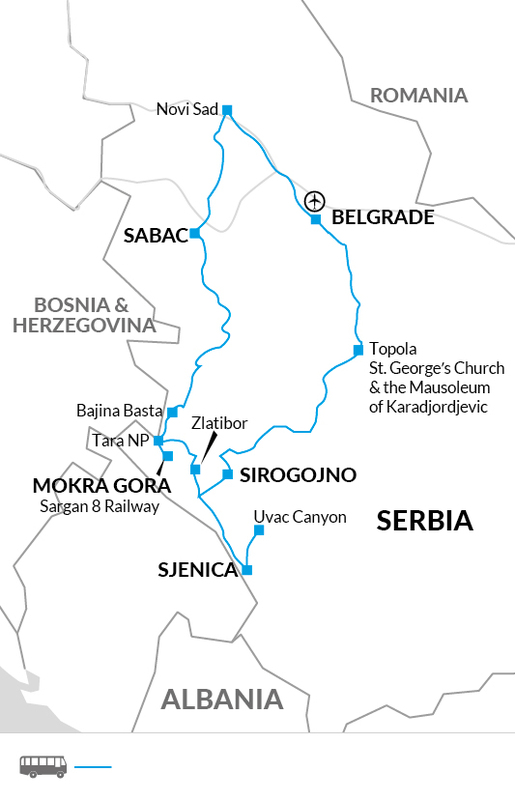 This morning we'll ride the famous Sargan Eight narrow-gauge railway on which the affectionately known 'Cira the Steam Train' once ran daily between Sarajevo and Belgrade. The Sargan Eight section was reopened to tourism in 1999. It was once admired around the world as a piece of world-class construction, for it allows the train to make the steep climb through the mountains on rails that form a figure of eight as they weave through 22 tunnels and cover just over 15 kilometres. As the crow flies, the distance between the stations of Mokra Gora and Sargan is a mere 3.5 kilometres. The train route once brought prosperity to a cut-off region of West Serbia but now offers nostalgic rides up the mountain to visitors mostly from Serbia and the neighbouring countries. The train will make multiple stops along the way for the chance to overlook the wilderness of Tara National Park and there's time for an ice cream or strong, Serbian coffee at the top. After our ride we'll have a fish lunch and head to the mountain resort of Zlatibor. This afternoon you are free to wander at your leisure. The village has a very traditional market selling local food produce that they are happy to offer tastes of, as well as handicrafts and there's also an array of coffee bars and Serbian restaurants. However, if you'd prefer to relax in the sunshine, the lake is the centre of the village where you may just choose to watch the world go by. This evening we'll make the 2.5 hour transfer to Sjenica where we'll be staying for the night. Today we go in search of the griffon vultures in their homeland of Uvac Nature Reserve. Our destination is only a short distance from Sjenica and we'll begin by taking a leisurely walk out to the viewpoints where we hope to see vultures soaring above the limestones cliffs across the canyon. The reserve is also home to 104 other types of Eurasian birdlife and offers spectacular views of the Uvac River which meanders below. We'll gently hike down the side of the canyon to the riverbank for a boat ride and even from the water you may catch a glimpse of the vultures in the nests they've built cautiously into the rock face. Our boats will take us to the entrance of Usac Cave which forms the greatest part of the extensive underground network in the area. Our guide will show us the abundance of beautifully formed stalactites and stalagmites by torch light as we proceed 500 metres along the path into the 7 kilometre long cave. A picnic lunch will later be enjoyed in this wild setting. After a day out in the fresh air we'll journey to the highland village of Sirogojno. Once famed for its high-quality knitwear during the 1970s, Sirogojno sweaters graced the catwalks from Paris to Rome. Today, its home to an intriguing open-air museum where visitors can learn about traditional Serbian lifestyles and will be our home for the night in typical wooden lodges. Tonight you may wish to go to the small village tavern for a drop of Rakia or a coffee. After a chance to look around the museum at Staro Selo, we will start on the journey back to Belgrade. We'll stop off at Terzica Avlija, a not-for-profit museum created to capture the rural culture, traditions and customs. The park features an old classroom from the early 1900's, a traditional house setting, weaving workshop and pottery barn, as well as many displays of Roman, Ottoman and World War I artefacts found in the region. Here we will also have a typically hearty Serbian lunch cooked traditionally in clay pots in their Log Cabin Inn. This afternoon we'll take a two hour drive north to Oplenac, where we will visit the fascinating Saint George's Church and Mausoleum of the Karadordevic family. Karadorde Petrovic, grandfather of King Peter I, was the leader of the first Serbian uprising against the Ottoman Empire and the patriarch of the Karadordevic family dynasty. The family's checkered history and ongoing blood feud with the Obrenovic Dynasty led to the family being exiled from Serbia but after the Obrenovic family was killed in a military coup, Peter Karadordevic returned to Serbia to reclaim the throne in 1904. Once appointed he immediately began work to build Saint George's Church on Oplenac Hill as a family mausoleum and it was beautifully constructed with five white marble domes and decorated with Venetian mosaics throughout. There are now six generations buried here and his wishes to have his family buried together have led to exhumations in Britain, USA and most recently in 2012 in Switzerland. We'll also visit King Peter's House, now a museum that was built opposite the church for the purpose of overseeing the construction. Here our guide will show us around the small summer residence which now features exhibits from the Karadjordjevic reign, including letters discussing the commencement of World War I. Late afternoon we'll take the 1 hour drive back to Belgrade to arrive early evening in time for a last night group meal. This morning after breakfast the trip ends at our hotel. Belgrade: Danube and Sava Rivers boat trip from €7.00. July and August are the hottest months, but the weather is changeable all through the year. Light rainwear may be needed at any time of year. Lightweight trail boots or trainers for the national parks and sandals for relaxing. One main piece of baggage and daypack.Remember you are expected to carry your own luggage so don't overload yourself. A torch, water bottle, insect repellent, suncream (at least factor 15), good quality sunglasses and a lipsalve with sun protection. Although entirely voluntary, tipping is a recognized part of life in this region of the world. Some local staff will look to members of the group for personal recognition of particular services provided. Accordingly you should allow approx. £10 for gratuities for local staff. The accommodation at Staro Selo, Sirogojno consists of a variety of wooden cottages typical to the Dinaric Alps of Serbia. Built on stone foundations, they feature log walls and high thatched or wooden rooftops with cone-shaped chimneys. Their interiors are simple and rustic, and include a hearth fireplace where traditionally the household would gather each night for the preparation and consumption of dinner. There is no single room option available on this night as each lodge has varying capacity between 2 - 5 people. Bathrooms are shared, modern and have hot water. Although simple, they are located near the old village tavern and offer excellent views of the surrounding area. Serbia: Visas are not required by UK, Australian, New Zealand, US and Canadian citizens. This trip is designed to acquaint you with the highlights of Serbia in just 8 days. For a majority of the trip we will travel by private bus to make the best use of our time. Once we reach each destination our explorations are mostly done on foot, so please bring sensible footwear and be prepared for the busy nature of this enthralling holiday. This trip is a chance to discover Serbia's wild side. A walk in Tara National Park will bring us to the Serbia's most beautiful outlook, Banjska Stena. An unexpected spot in the middle of the woods, where you can take in the spectacular scenery of the Drina River, neighbouring Bosnia and Herzegovina and the rugged mountain backdrop. We'll also go in search of griffon vultures. These birds are protected here and have chosen the vertical cliffs of Uvac Canyon as their nesting ground. We'll try to spot them soaring above whilst hiking down to the river bank and once aboard our boat we'll hope to catch a glimpse of their nests.